Indonesia is a country in Southeast Asia that consists of over 18,000 islands.The country’s position on the equator gives it its infamous tropical climate and lush jungles. Indonesia started out as a Dutch colony, had a brief stint under the Japanese, and then became independent. Nowadays, Indonesia thrives with the fourth highest population around the world and very strong import, export, and tourism industries. In the picture above is part of an Indonesian army. When Japan invaded Indonesia in 1942, they helped to provide training and supplies for the Indonesian nationalists. 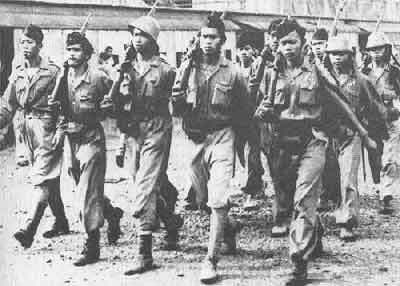 Later, when Japan surrendered in 1945, Indonesia took its recently prepared people and fought for their independence. It was at this point, without the Dutch or Japanese, that Sukarno declared independence for Indonesia. This image depicts the original raising of the Indonesian flag on August 17th, 1945. The first flag, known as Bendera Pusaka, was sewn by President Sukarno’s wife, Fatmawati. Since 1922, the red and white flag was used by Indonesian nationalists as a symbol of rebellion and independence from the Dutch. Later on August 17, 1945, the flag was officially adopted and is commemorated annually on what is now known as Indonesia Independence day. The colors of the flag, red and white, have a couple different meanings. The first Interpretation of the colors includes palm sugar because of its red color, and rice for the white color. Another perception of the colors is red to represent courage and sacrifice while white represents peace and purity. This is some of the first rupiah (Indonesian currency) that was printed in 1953 after the Bank of Indonesia was established. Before the rupiah, Indonesia used the De Javasche Bank Rupiah, and then later the Netherlands Indies Guilden. The repeated switching of the currency caused inflation and devaluation which caused national financial crisis. The Asian-African conference (Bandung Conference), was April 1955 in Bandung, Indonesia. This conference was a collection of the leaders of 29 different countries in order to create unity and solidarity between these nations. They were able to branch off the previously established Five Principles of Peace and sign a declaration that included some solid ideals.This conference was one of Indonesia’s first steps as an independent country and a rather momentous occasion in its historical timeline. This is the Monumen Nasional or the National Monument of Indonesia. By order of President Sukarno, the monument was designed by Friedrich Silaban and construction started in 1961. The monument was built in order to commemorate the fight for independence from the Dutch. The shape of the structure is meant to symbolize harmony and unity, but can also be seen as the infamous rice pestle. Indonesia’s first Constitution was written in 1945 by the Independence Preparatory Committee as a short term, short notice measure right before the surrendering of the Japanese. The potential amendment of the constitution was the center of much debate, some even resulted in the resigning of Suharto. Eventually there were four changes made, making it a stronger and balanced structure for Indonesia’s government. Indonesian President Sukarno (1945-1967) is depicted reading the Proklamasi, or Proclamation of Indonesian Independence on August 17, 1945. From 1908 to 1945, Indonesia remained a colony under the Dutch. In 1945, Indonesian nationalist decided to move toward their previously promised freedom and declared Indonesia an independent state. It was not until November 2nd, after ten weeks, that an agreement was achieved. At that point the Dutch freed thousands of political prisoners and official independence was on December 27th, 1945. This mid 19th Century stamp, known as a Cap, is used for the art of making batik. Batik is a type of fabric that’s pattern was created by ambatik, which is the use of wax to block out a pattern before dying. Although batik is found in many places around the world, it has been found to be most developed in Java, Indonesia. Batik is found everywhere you have your eyes open in Indonesia and has benefit the country greatly by not only creating numerous jobs making and selling batik and batik products, but also the revenue brought in because of the industry. Indonesia may be one of the more forgotten countries, but that does not mean it is insignificant. Although the country has had many struggles over the years, it successfully won its independence and created a government that is still standing strong since it was established. Indonesia has contributed greatly to world trade and politics.